If you ask a zoologist, a scorpion will hide and look harmless or unobtrusive, then unleash either brute force or the sting in the tail on its victims. This makes the scorpion an excellent emblem for Abarth, the prestige and sport line of Fiat. The Abarth 595 is a prime example of this scorpion-like behaviour: looking harmless but delivering a lot of punch. There’s no denying that style-wise, the Abarth 595 looks kind of quirky and whimsical, though not exactly unobtrusive. You can still see the old 500 in the overall design and it doesn’t look like your run of the mill hatch. This three-door hatchback is small, cute and bug-eyed, with lots of curves and pretty round fog lamps and daytime running lights. There’s something almost teddy bear-like about the styling… until you take a closer look. Then you get a glimpse of red brake callipers, the deep air intakes, the 16-inch alloy wheels and the Abarth badging. This gives you the idea that this is not your grandmother’s hatchback (unless you have one of those wild and crazy grandmothers who is a glamorous racing driver at heart). What looks harmless can pack one heck of a punch. And the Abarth 595 certainly can pack a lot of punch. There’s a reason why it’s got those pretty red brakes and the Abarth sports exhaust. There’s a reason why the designers decided to put a flat-bottomed racing style steering wheel and sports pedals inside. Underneath that sweetly perky bonnet is a 1.4-L turbo engine that pumps out 107 kW of power and 206 Nm of power. At first glance, this might not seem massive but you have to remember that this is a small car, so you can do the maths and the physics to see that this amount of power and torque does a whole lot more when this inline-4 has to shift this low mass. The Abarth 595 can do the 0–100 dash in 7.8 seconds, depending on how nimble and cunning you are with the five-speed manual transmission. The Dualogic automatic transmission with paddle shifters gets up to 100 km/h a shade slower but still does the job in a very respectable 8.0 seconds. The handling on the Abarth 595 is nimble and responsive, thanks to the front adaptive suspension with frequency selective damping. Of course, you can play around with the sport mode selector button so you can get the driving style you like when you want to. Electronic stability control also plays its part during cornering and similar manoeuvres. The Abarth 595 is a car that’s designed for drivers who know what they’re doing and who want to take charge rather than letting the machine do the job of driving for them, so the driver assistance features are kept to a minimum, namely rear parking sensors (it doesn’t skimp on the safety features, as it’s got the full complement of airbags and top quality pretensioned and load-limited seatbelts all round). They also haven’t skimped on the connectivity, with navigation and Bluetooth phone/audio coming as standard, along with steering wheel mounted controls and voice recognition. The display panels are kept in scale with the vehicle as a whole, with the 7-inch instrument display cluster and the 5-inch display screen harmonizing nicely with the rest of the dash (and you can switch the instrument display cluster to a sporting layout if you like). The black cloth-trimmed seats are very comfy and the little touches of leather here and there are quite nice. The Abarth 595 was never designed to be a people-mover, but it does seat four reasonably comfortably and has ISOFIX child seat preparation in the rear seats. Other conveniences for the driver and for the passenger(s) come in the form of manual climate control, a 12-V power outlet and power windows – with a power sunroof available as an option. The designers seem to have the attitude that the Abarth 595 is all about the fun of driving, pure and simple, without the bells and whistles. The Abarth 595 comes with possibility of nine body colours, all of which combine quite nicely with the chrome-trimmed door handles, while the bumpers and the mirrors are body coloured. My guess is that the red will be one of the more popular options (it’s called Abarth Red), but you can also get other bold primary colours in the form of Modena Yellow and Podium Blue, if the blacks, whites and greys don’t appeal to you. If you’re into the combination of quirky looks and sporty handling offered in an Italian sports hatch package, then the Abarth 595 is well worth considering. 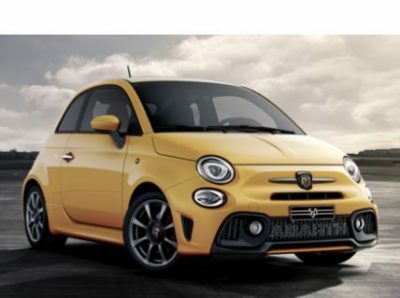 For any more information on the Abarth 595, or for that matter any other new car, contact one of our friendly consultants on 1300 303 181. If you’d like some fleet discount pricing (yes even for private buyers! ), we can submit vehicle quotes requests out to our national network of Abarth dealers and come back with pricing within 24 hours. Private Fleet – car buying made easy!